Virtual Visit from Author Emma Lai! What do love best about writing? I’m a complete panster and love watching the characters and plot grow. It’s like watching a movie unfold, and I love movies! Sometimes, I’m surprised by what the characters do, and for me, if I tried to plot then I would feel compelled to force my characters to act in the predetermined way. Plus, it makes the writing process more emotional for me, allowing me to experience the highs and lows as the characters would when faced with, well whatever they’re faced with. I can so relate, Emma. When I’m in first draft, I feel as though I’m the reader, waiting as the story unfolds. Makes for writing that’s as much fun as reading! What do you like least? This is a moving target. Edits are always difficult, but if they strengthen the story then they’re well worth the blood, sweat and tears. Promotion is also difficult, partially because I have a hard time putting myself out there, partially because of the time involved. However, I love interacting with other authors (we have a solitary lifestyle by profession) and hearing what readers have to say. What started you as a writer? My husband. He loves to read, yes even romance. I needed something to occupy my free time while I studied for my comprehensives, so I wrote him a story, which he insisted I share with his mother, who has some experience with the publishing world. They both pushed and pushed until I bit the bullet and submitted. Here I am two years, five releases and eight contracts later. Guess their faith wasn’t misplaced. What keeps you writing? I would literally go insane if I didn’t write. My mind is constantly working, and writing stories gives it something productive to dwell on. Writing is a great stress reducer for me. The biggest way writing has impacted my life was to inspire me to start a small e-publishing press, Twenty Or Less Press. I’ve found that while there are plenty of romance publishers who provide awesome feedback, even on rejected works, there just weren’t that many—or at least I didn’t come across them—e-publishers of other genres who provide much more than form rejections. As a writer, I continually strive to improve my skills, and one of the most helpful things I’ve received, is criticism from others. My publishing house provides constructive feedback on all legitimate submissions. (Legitimate as in following the submission guidelines.) I’ve received dozens of emails from authors expressing their appreciation for my honest feedback even though, for the most part, the feedback included rejections. My goal is to help other writers be the best writers they can. How exciting and mazel tov! I am so impressed by you taking on the business of publishing in today’s changing publishing paradigm. How did you come up with a name as intriguing and unique as the one you chose? Sorry; sidetracked! Back to the interview:Where do you get story and character ideas? And for those who write across cultural lines, how do you market or generate mainstream, typical reader’s interest in your books? I think this question applies to those who write across genres while using the same pen name. That said, I have just submitted my first interracial/cross-cultural story. Either way, my answer is the same: market the characters. Plot drives the story, but it is through the eyes of the characters that the journey is made. Strip the characters of whatever makes them genre specific and tell the reader what she has in common with them or why she’ll love them or hate them. As a reader, sell me on the characters, and I’ll read anything. Are we soul-sisters? I feel the same way w/a very slow-going project, but in the meantime, I’ve learned tons about web presence and social media. Please tell our readers how you juggle work (other than writing, assuming you work ‘outside the home’), time to write and all that goes along with it, especially as a published author (i.e., promo, etc). My life is one of deadlines. Everything is prioritized based on that. I’m blessed to have a husband with a flexible schedule so when due dates loom, he steps in to take care of the little one. If you please, talk about ‘my life is one of the deadlines’ in the comments’ section. In the meantime, kindly share the three ways you find most effective to promote your work: Promoting is about keeping your name out there even when there’s not a release in the near future. So, I tweet and do blog posts—though keeping with my desire to help other writers, most of my blog is devoted to showcasing the work of others. As time allows, I leave comments at other blogs as well. However, just as big as promoting is making sure I keep readers supplied with new stories. Leave a comment for a chance to win your choice of any of my published stories and an ARC of Book 3–when it becomes available. I’m also offering a $25 gift certificate to Amazon, Barnes and Noble, or The Wild Rose Press—winner’s choice—for rebranding suggestions left on my blog at http://emmalaiwrites.blogspot.com/2011/08/its-all-in-branding.html. 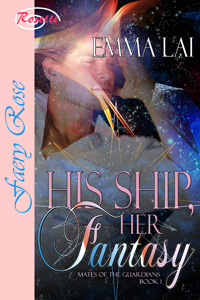 His Ship, Her Fantasy: Ellie Woods is in love…with a ship. When an argument with the ship results in a bump on the head, she finds herself in the strong arms of Alastair. But, who is he, and where did he come from? 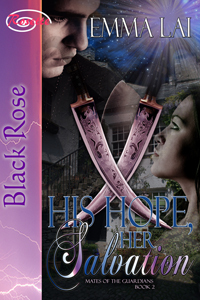 His Hope, Her Salvation: Promised in marriage to an abusive oaf, Judith resolves to find out if there can be passion without love. Snatches of conversation overheard at the local inn lead her to a mysterious American merchant who might be able to satisfy her carnal curiosity and capture her heart. Donovan, a Guardian Hunter, is on the trail of a rogue Elysian in Georgian England. As the son of the First Hunter, he long ago gave up hope of finding his heart’s mate. When Judith appears in his study, his inner beast and his heart demand he answer her plea for help. His Capture, Her Rescue (Coming soon from The Wild Rose Press): Masquerading as an American, Eallair, a Guardian Steward from another world, is searching Victorian England for the kidnapped mate of a fellow Guardian. When he meets Miss Harriet Cartwright, he knows her for the spirited, intelligent mate he has longed to find. Since the death of their parents, Harriet has used her intelligence and sharp tongue to guard her sister from fortune hunters, but now that Prudence is close to choosing a husband, Harriet can consider her own future—one hopefully filled with adventure. When she meets Eallair, an American rancher who likes to travel and isn’t put off by her outspokenness, she is intrigued. But before Harriet and Eallair can explore their attraction, she and her sister are kidnapped. While Eallair scours the countryside for them, Harriet discovers Eallair’s off-world origins. Now she must decide: just how much adventure does she want in her future? ← Talking Social Media at Emma Lai’s! Hi Emma. How fun to read about you and learn more. Commenting again because I don’t think I logged in. Emma, I enjoyed your blog. It was fun to read and learn more about you. Hi, Joanna! Thanks for sharing your blog with me today. So, the initial idea for Twenty Or Less Press was stories that were 20 pages or less. However, after looking at submissions and queries, it was decided to change the word count to accept stories of 20K or less. As for my life being one of deadlines…Between edit deadlines for stories I write, deadlines for queries my press receives (1 to 3 weeks), deadlines for edits for my press, deadlines for promotional material, well, my calendar stays pretty full. Especially when I throw in a two-year old because our whole schedule revolves around making sure we get as much quality time with him as possible…it won’t be long before he’s off to school. Now, in addition to the prizes listed above for commenting here, or on my blog, I’ll be gifting one person with a $10 gift certificate to either The Wild Rose Press or The Wilder Rose Press, winner’s choice. I love the story behind the story, Emma. I remain amazed at how much people manage to juggle and remain sane. A contest! Did I miss something in your post about prizes or did you just add this? There’s some info buried in the blog…just because I’m contrary that way. 🙂 There’s a $25 gift cert for leaving me re-branding suggestions and eBook giveaways for random comments left during the week. Good luck to everyone! Can bloghosts win, lol? Hello Joanna, Emma. Congrats on your two year anniversary. And wow. You’re venturing into publishing. That is so cool! Good luck. Hi Lynn (and everyone :)). So nice to have you all here! I am definitely going to take a look at your press, Emma. Sounds good! Congratulations Emma! And His Capture, Her Rescue sounds wonderful. I’m trying to do reviews at my blog and I need to get going on one for Twice is Not Enough. I loved that story. Deadlines – hate ’em – but part of the whole romance thing. Good luck with the e-publishing endeavor! Sounds exciting! You’re so sweet, Patsy! I, myself, have recently decided to convert my spicier side blog to reviews for self-pubbed and small press erotica. We’ll see how that goes. Hmm. This is all so interesting! I love the e-book fairy, and I already made my way to your re-branding post and left a comment there. I’ve discovered the joy of keeping gift-cards uploaded to my Nook, lol. I love, love, LOVE watching a book unfold. So much fun! Especially when a character throws you a curve ball, which just happened in my WIP. As for going insane if you didn’t write? I’m with you there, too. 🙂 Have a great day, my friend, and Happy Anniversary! To answer Joanna’s question: You can’t go wrong with any of Emma’s books! Thanks for the lovely compliment, Sarah! I feel compelled to mention Sarah’s upcoming release, After Midnight. I won and ARC and spent all day yesterday reading. I couldn’t put it down. So, keep an eye out for it! Congratulations, Patsy! Excel has chosen you as the winner of the $10 gift certificate and the ARC of His Capture, Her Rescue when it becomes available. Now, while there can be only one winner of the gift certificate, everyone can have the eBook of their choice from any of my current titles!